With the same song on both sides, one in Stereo and the other in Mono, there is no commercial equivalent to this promotional issue. It was distributed to radio stations only. There are a couple of stories behind this record. One story is that the song's publisher, Al Gallico, had this single pressed to send to radio stations which would eventually force RCA to commercially release this song.3 Another story is that there were those within RCA whom were pushing for the release of this song as a single so without approval produced and issued this promotional 45, hoping to force RCA into releasing the single commercially. 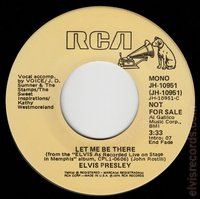 The record was quickly pulled.4 Although never released commercially as a single, the song was pulled from the DJL1-0606 Elvis: As Recorded Live On Stage In Memphis and was brought back to fill AFL1-2428 Moody Blue5. Sources offer several different dates for the release of this single ranging from 6/19742 to 19777 to 3/1977.4. 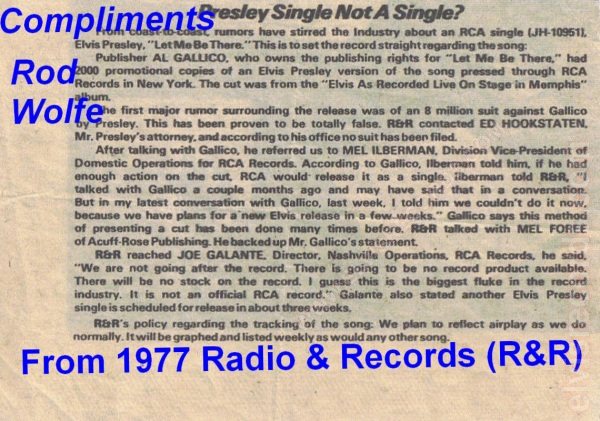 The 1977 dates can be collaborated a couple of ways, by catalog number and by record label design. 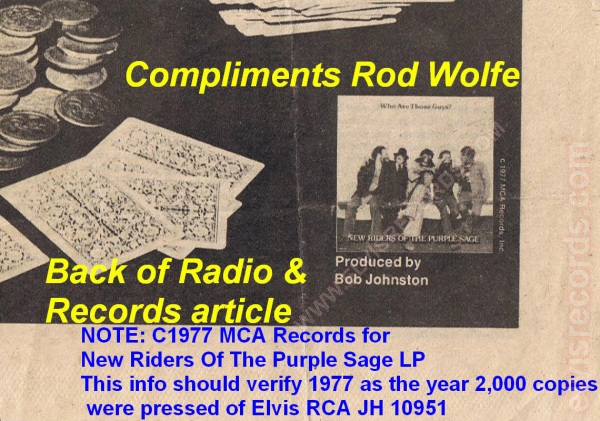 An April 2, 1977 issue of Billboard lists RCA JH-10946 Neal Fox with song Babe. A promotional copy of RCA JH-10948 Flame with Beg Me b/w Angry Times exists with 3-21-77 written on the label. A May 28, 1977 issue of Billboard promotes RCA JH-10954 (PB-10954) Jesse McFall and Jess Mack Class Reunion with Tell Me When You're Ready. An alternate method of collaboration is by record label design. Promotional labels of 1974 were printed in yellow with RCA on side and did not feature the dog near top. The label design for Let me Be There is consistent with other promotional labels of this period. The Record Digest, vol. 1, issue 1, from September 1977 edited by Jerry Osborne offers a small blurb about this single, but enough of one to put the date to rest.